It's book canon that Azkaban is "in the middle" of the North Sea, and according to a remark made by JK Rowling during an online chat session, it's in the north of the North Sea. Remus also says that it's on a tiny island well out to sea and we know from Hagrid that the prison is big enough to hold a couple of hundred prisoners, at least, although how crowded they are we don't know. We know that in 1993, the year Sirius escaped from Azkaban, and assuming the Prophet's report was accurate, the Weasleys went out to Egypt round about the last week of July (because they went there for a month and were due back a week before 1st September). Some time between late June, when Hogwarts broke up for the summer, and late July when the Weasleys went to Egypt, the Daily Prophet carried a photograph of Ron with Scabbers, Fudge gave the paper to Sirius and Sirius began plotting his escape. We don't know exactly when Sirius escaped - his escape was reported on the Muggle news on the morning of Harry's birthday but we don't know that that was the morning after his escape. However, it may very well have been. We also know that Aunt Marge arrived on Harry's birthday and stayed for a week, and that on the last day of her stay Harry quarrelled with the Dursleys, went out into the street and saw Padfoot!Sirius watching him. At least seven days had elapsed between Sirius's escape and Harry seeing him: possibly more if the news report on Harry's birthday wasn't immediately after the escape. Sirius speaks of glimpsing Harry, which sounds as though he only saw him the once - he hadn't been hanging around the area for days - so we can say he took around eight days to get from Azkaban to Little Whinging. The main groups of small islands in the North Sea are around the edges of continental Europe and also around Orkney and Shetland. Sirius swam to shore as a dog, and a very thin dog - pace Remus it's not likely that Azkaban is as far away as the continental side of the North Sea. Sirius also apparently arrived in Little Whinging before he journeyed north to Hogwarts - and there's no suggestion that he started somewhere up near Orkney and travelled all the way south to see Harry, and then back north again. Indeed he speaks as though his coming to see Harry in Little Whinging was a whim, not the same sort of drive which drove him to Hogwarts, and this in turn suggests he came ashore somewhere fairly near London and didn't have to make too big a detour. So, where might Azkaban be? If you look at relief maps of the floor of the North Sea it's pretty flat, so possible locations for islands in the middle of the water are not obvious. It might be associated with one of the real-life sandbanks in the North Sea, and if it really is in the northern half of the sea then one thinks of Ling Bank or Great Fisher Bank - but could even a large and powerful dog swim from there to the south of England? It's likely that Padfoot, who is described as a bear-like black dog with pale eyes, is actually a Newfoundland. According to The Newfoundland Club pale eyes in dark-coated Newfoundlands are quite common, and they have an oily double coat and webbed feet which would certainly improve Sirius's chances of surviving a very long swim. But even a Newfoundland would surely not be able to swim to shore against the current, from a very long way out. If we look at the currents in the North Sea, they tend to carry objects away from the shore of Britain, except for one north-to-south current which hugs the coast from Orkney to Norfolk. In order for Sirius to have made landfall in England, then, Azkaban cannot really be all that far out to sea - not more than fifty miles or so - in order for the current that sweeps south down the side of Great Britain, close to the coast, to be on hand to carry Sirius to land. Fudge must have been using the term "the middle of" loosely (as Britons often do) to mean "well out in". Otherwise, if Azkaban were much further out than fifty miles the currents would sweep Sirius east, and if he made landfall at all he would have ended up in Norway or Denmark. I suggest, therefore, that Azkaban is south of the area called the Long Forties, somewhere off the coast of southern Scotland or the north of England - close enough to shore to be involved in the coastal current - and Sirius was caught up in the current and carried south to make landfall somewhere around The Wash, in Norfolk. He then spent several days recuperating and making his way slowly to Surrey, before turning north again: it's even possible that he went straight to London and spent some time at Grimmauld Place. According to Norwegian Tidal and Sea Level Data the North Sea current close to the shore of Britain is moving at about two knots - that is, two nautical miles or 2.3 land miles per hour. That means that if Sirius were being carried along by the currents, then even aided by a powerful but necessarily intermittent doggy-paddle he would still probably only have been doing about 3.5mph, or about human walking speed - so we want him to have started as far south as we can get it and still have a reasonable claim that Azkaban is in the northern half of the North Sea. 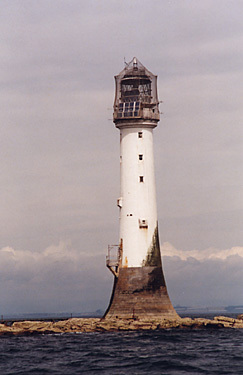 If we site Azkaban somewhere off Northumberland, about level with the Farne Islands, it would still be two hundred miles from The Wash, so Sirius would have been in the water for about two and a half days - which would certainly explain why he was still in the Surrey area five days later, and hadn't yet set off for Scotland. If he was quite close to the shore he would, at least, probably have been able to drink a bit: his canine sense of smell would have told him where there were skeins of fresh water coming off the mouths of the major rivers. South-east of Dundee, there actually are two small islands in the middle of open water: the Isle of May, which is about a mile long and a quarter of a mile wide, lies only five miles offshore and used to have a substantial monastery on it, and the Bell Rock, eleven miles out to sea, which is only an island at low tide - at high tide it's 12ft below water and you wouldn't know it was there, if it didn't have a lighthouse on it. So it's quite possible to imagine an intermediate mid-ocean island of the same kind in the same area - one that stayed just about above sea level, and was just big enough to bear a prison holding a couple of hundred souls, and was concealed by magic. If it was in the same area as the Bell Rock, though, it would be about 260 miles from The Wash and Sirius would probably have been in the water for three whole days. Perhaps, having reached the shore and reverted to human form, Sirius was able to perform wandless Apparition, so that he made landfall in Scotland or northern England and then jumped to Little Whinging, and thence to Hogsmeade. He only says he "journeyed" north, after all - not that he necessarily walked. Or perhaps he hitch-hiked, before his image was posted on the Muggle news. In that case, we can dispense with the requirement for him to have spent two or three days in the water, although we still don't want Azkaban to be very far north, otherwise it still wouldn't make sense for Sirius to land in the north of Scotland, journey (by whatever means) all the way to Surrey to see Harry and then journey all the way back to the north of Scotland again, given that he presents his detour to Little Whinging as a minor indulgence rather than something he was prepared to travel the whole length of the country for, and there seems no particular reason why he should lie about that. Unless, of course, he really came all that way south in order to complete some business at Grimmauld Place, and he has some reason not to want to mention it at that point. It does make sense for Azkaban to be near an existing shipping hazard such as the Bell Rock or the Farne Islands, because it would make it much easier to hide. There must be some system in place for making Muggle ships swing wide of the place but that would leave a noticeable gap in any maps of shipping lanes etc.. If Azkaban is near a real-world hazard, Muggle navigators would just assume ships avoided that area because of that known hazard, and would not notice an anomaly. Of course, if we ignore interview canon, and simply go by what's in the books, it would make far more sense to assume that Azkaban lies somewhere off south-eastern England, so that Sirius only had to swim maybe five or ten miles, and Little Whinging is more or less en route between Azkaban and Hogwarts. It can't actually be in the English Channel, off the South Coast, because it's book canon that Azkaban is in the North Sea: but if it were in the shallow area called Smith's Knoll, for example, some miles out from Yarmouth, the current would naturally carry Sirius down to Kent and from there it would be easy to reach London and Little Whinging. However, Smith's Knoll is a herring-fishing ground: the problem with the more southerly waters, generally, is that they have a lot of traffic which would make Azkaban harder to conceal. Tonks IsCool however has pointed out that if Azkaban is somewhere where there are numerous hazards to shipping, it could be right among these hazards and that would prevent all but the shallowest-draught Muggle ships from going near it even without the need for magic. 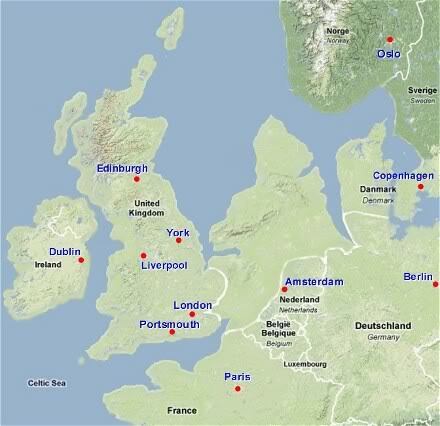 A location among the banks off the south-east coast of England would also have the charm of placing Azkaban in Doggerland, the area of fertile land between eastern England and the coasts of Belgium, the Netherlands and Denmark which was drowned by rising sea-levels and a catastrophic tsunami at the end of the last Ice Age: Dogger Bank is the remains of a submerged range of hills. Dogger Bank itself is a poor location for Azkaban because even at the western end, closest to shore, the currents around it tend towards Denmark. But if we can find a location around the South-East Banks or Smith's Knoll which is so hazardous that it keeps the herring boats away, then Azkaban might be there, and you could imagine that it might be built on the site of a wizard stronghold which stood high up on top of a hill in Doggerland in the late Stone Age - a hill which was just high enough to still protrude above the waves while all those around it lie just below the surface. If we accept interview canon that Azkaban is "In the north of the north sea" we have to deal with the fact that when Sirius swam from Azkaban to the shore he nevertheless apparently made landfall close enough to London that he was able to visit Little Whinging on a whim, en route to Scotland, and he patently wasn't in the sea long enough to drown or die of exposure or thirst. Therefore, we have to interpret "the north of the North Sea" to mean "the northern half of the North Sea" and place Azkaban as far south as that will allow; and close enough to land for the north-to-south coastal current to have picked Sirius up and done most of the work of carrying him south, without being so close to shore that that current and his own doggy-paddle would have landed him quite close to Azkaban and far too far north to visit Little Whinging. 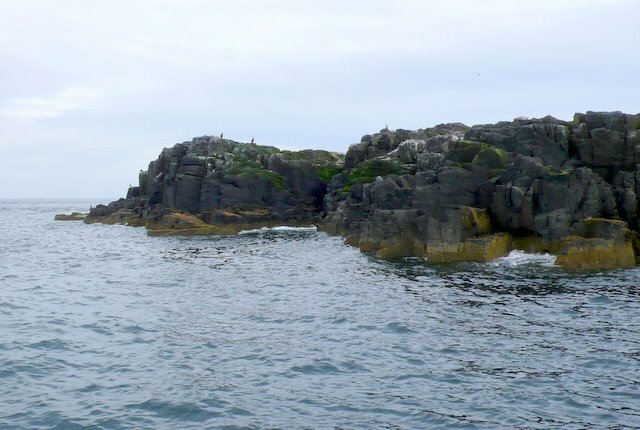 That puts Azkaban not more than about fifty miles out to sea and probably either off the Farne Islands in Northumberland or - at its most northerly possible limit - off the Bell Rock/Isle of May group offshore of south-east Scotland. 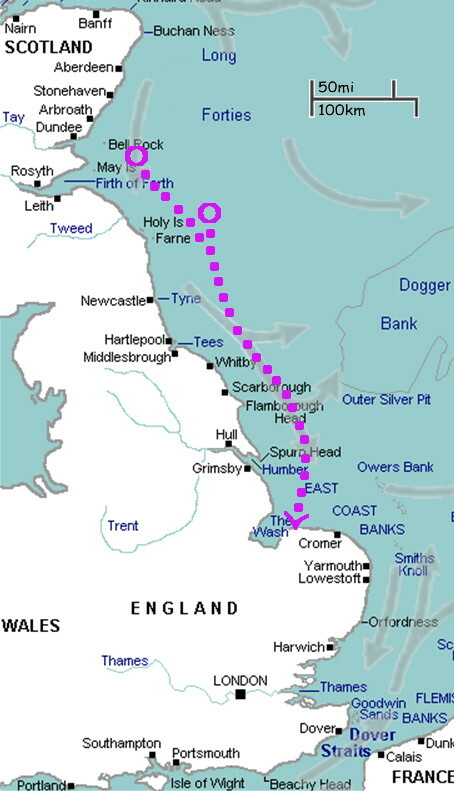 On the other hand, if we ignore interview canon and just go with what's in the books, making Sirius's journey as feasible and survivable as possible, then Azkaban is probably about ten or fifteen miles off the south-east coast of England, at the southern end of the North Sea. It may stand on what was once a high hill in the drowned countryside of Doggerland, surrounded by other, submerged hills which create a hazard which keeps Muggle shipping away.